Always having trouble getting your product data in your webshop, the way you want it? Discover the possibilities of Icepim, the "in the cloud productmanager". Icepim is a flexible and powerful platform that imports any kind of data of any volume into a mastercatalog. You will be able to select, filter and create subcatalogs with all kinds of pricing, product relations (upselling), select warehouses, maintain product categories and brands, etc. If you would like to receive a quotation please contact sales@iceshop.nl and let us know your wishes and requirements. IcePIM has an advanced assortment import system to get your products imported in simple steps. Your assortment files/feeds can come from many locations; IcePIM will import these assortments, filter them tly and matches the duplicates as 1 product with different suppliers or warehouses. Besides that you can import your content. Default IcePIM is able to import Icecat (open Icecat & full Icecat) datasheets which will automatically be added to your assortment. Icepim automatically manages the product type property fields, including multilingual translations. Of course also custom made imports for other content suppliers are possible. In the import section of IcePIM you can import your assortment. Basically you have two choices: import via Iceimport and get a standardized, categorized and daily up to date assortment from your distributor(s) or import your own assortment(s). Own assortment files can manually be imported in Excel or csv format. A field editor supplies the flexibility to import any csv file. Often suppliers send you a full assortment file with everything they have to offer. This is not always what you are looking for. Filtering this assortment is no problem; IcePIM has a flexible filtering mechanism to exclude or include ranges of products based on the filter rule values you can set. Filtering on brand, supplier, category, stock, price etc. or any combination thereof is possible. The assortment manager has a set of very flexible and powerful tools. The products should be categorized in a specific hierarchy. For this we have the category manager; your own category tree can be set-up which is easy to organize. One of the most important things is the product editor where you can manage and update your product content. You can edit all data of a product like name, descriptions, images, properties, suppliers, stock levels, weight etc. Of course you can overwrite the content supplier's data and lock this information so it won't be overwritten. Added to that we have a powerfull product relation manager where you can batch relate products to a whole selection of products e.g. relate 3 selected laptop bags to all Laptops, so all new imported laptops automatically get these bags as an accessory. Pricing is supported in a separate module, see Product pricing. In the category manager you can manage your own category tree. The categories can easily be organized by moving partial trees to other categories, add, rename or remove categories and add an image or description to them. The brand manager lists all available brands in your assortment. Adding and removing brands can be easily done, when new products with unknown brands are imported, by a click of the button. tly descriptions and brand logo's can be attached to the brand. To manage your content we have a very flexible and advanced product editor. Based on the products properties you can add information to the product, see the current suppliers with their prices (often purchase prices and recommended retail prices), stock levels and the preferred supplier. An advanced batch editor is also available for editing many records at once. The pricing engine is a very powerful tool to create your price settings based on the available prices in your source files. Normally you will have your own purchase prices available from your distributor/supplier, but occasionally recommended retail prices or end prices are also available for groups of products. Every new price rule can be set on a single SKU or group of products (product type, brand, supplier, and combinations thereof). Since it is possible for price rules to overlap, you can set priority (sort order). E.g. different price rules for brand "HP" and product type "printers" will cause a conflict. By setting a sort order you can prevent this. You can choose between fixed prices, absolute or percentual markups/discounts or margins on source price. Every standard price you set can also have special price settings (sale promotions) for a period of time. You can administer an unlimited number of warehouses, i.e. your own stock locations and those from your suppliers that hold stock (virtually) for you, and you can import those on a daily basis with our Iceimport service. Using the warehouse selector function, you can set priorities in case certain products or productgroups overlap in your assortment file. For instance HP inkjetprinter abc123 is available from supplier 1, supplier 2 and your own stock. You can set preferences based on product(group) but also dynamically on brand and/or productcategory. Independent from that you can configure the system to select products on basis of stock and/or purchase price. So you can say: 1. select suppliers with stock, 2. select supplier with lowest purchase price. As a result your assortment will contain no double product SKU's, just one of each with the lowest price and on stock! Exporting data files is the final stage. Now you can define different exports to different systems. First you select objects to export (e.g. 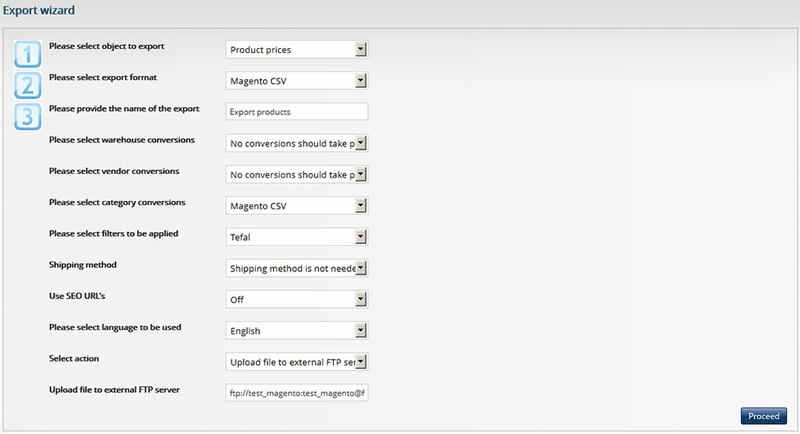 products & prices), then you select the export format (e.g. 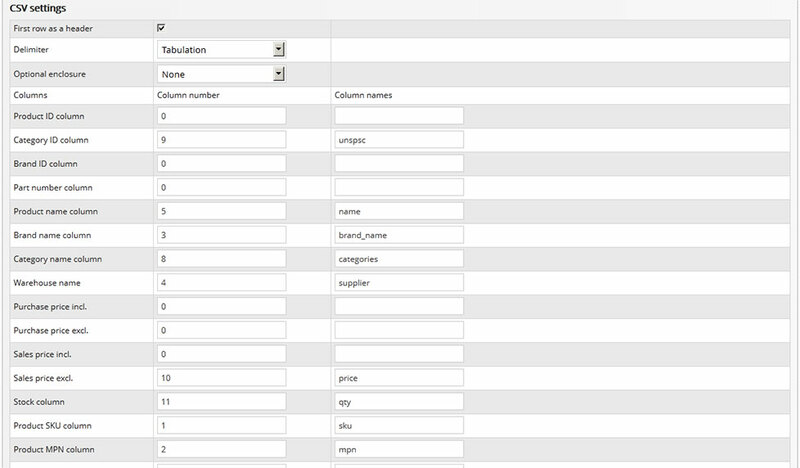 CSV) and then some specific parameters like filters, conversions and what location to save to (e.g. ftp server). Attention! For Magento webshops we developed some advanced extensions, go here for more information on Ice Magento tools. The second screen offers you a column mapping facility. In this case you define which column corresponds with which field name, to get the correct file for your webshop or (ERP) system.